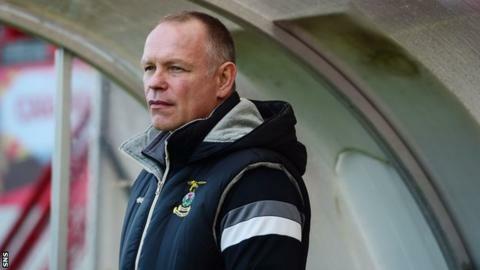 Inverness Caledonian Thistle boss John Hughes believes his PFA Scotland manager of the year nomination is an honour for everyone at the club. However, he also feels vindicated after feeling written off when he first took charge last season. Hughes has taken Caley Thistle to their first ever Scottish Cup final and they are currently third in the Premiership. "I'm doing something I love and I promised myself years ago to enjoy every single minute of it," he said. "My father always said actions speak louder than words. "I cannot do anything about people's perceptions. One thing I will say, we all take football far too seriously and we forget to laugh. It's only a job. "I don't think a lot of people know the real John Hughes. A lot of people say they do, I would say there's only half a dozen that really know me. "If it's me laughing and having a joke that makes people come up with a perception that I don't take it serious, you'll need to ask these five or six guys that know me what it means to me. "I managed Falkirk for six or seven years; Challenge Cup, League Cup semi-finals, Scottish Cup final, but more importantly keeping them in the SPL. I built an academy too. "I played until I was 40, that's a fantastic achievement. To play until you're 40 you have to have a discipline amongst yourself." Hughes was nominated for the manager award alongside last year's winner and Aberdeen boss Derek McInnes, Celtic manager Ronny Deila and Hearts head coach Robbie Neilson. "It's an honour to be in the company of the other three guys," Hughes said. "It's an accolade for the club and the work everybody has put in, and I'm quite sure we might have an opportunity to have one or two in the team of the season. "There's a lot of good things happening in Inverness." The Highlanders are in the driving seat to qualify for the Europa League through their league position, though have only won once in the Premiership since January. But Hughes said: "It never plays on my mind because I look at performances. We've been picking up draws so it's not as if we're getting beat every week. "The league form is going to have to be a lot better than it has been over the last four or five weeks."